Well if you’ve been a reader for awhile, you know whenever there’s a Target designer collaboration, I’m going to be waiting at the doors at 8AM when my local store opens to see what’s what! 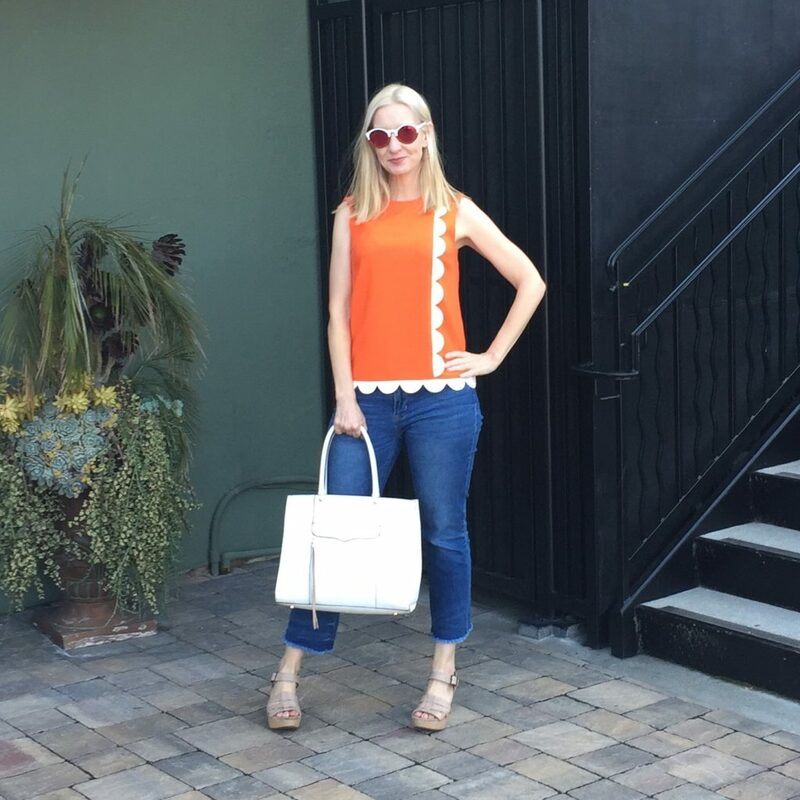 I’m super happy with this cute orange “Circus Scallops” top that I got, but there were some disappointments also. My biggest disappointment is that all of the dresses were soooo short! Come on Victoria, you could’ve put a knee-length, midi, or maxi in the mix, right? 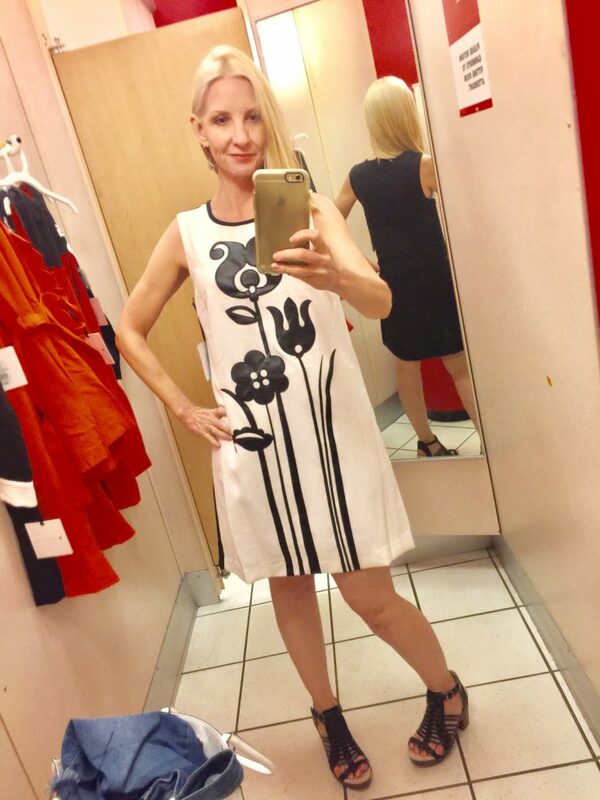 Here’s all my super bad dressing rooms selfies, with some comments on each about fabric, fit and sizing. This is one of the dresses I had my eye on. It was way too short, I didn’t like the fabric, and it had bunnies on the collar, which I never noticed in the photo. A big no for me anyway! Wearing size small, which was a little tight across my hips. 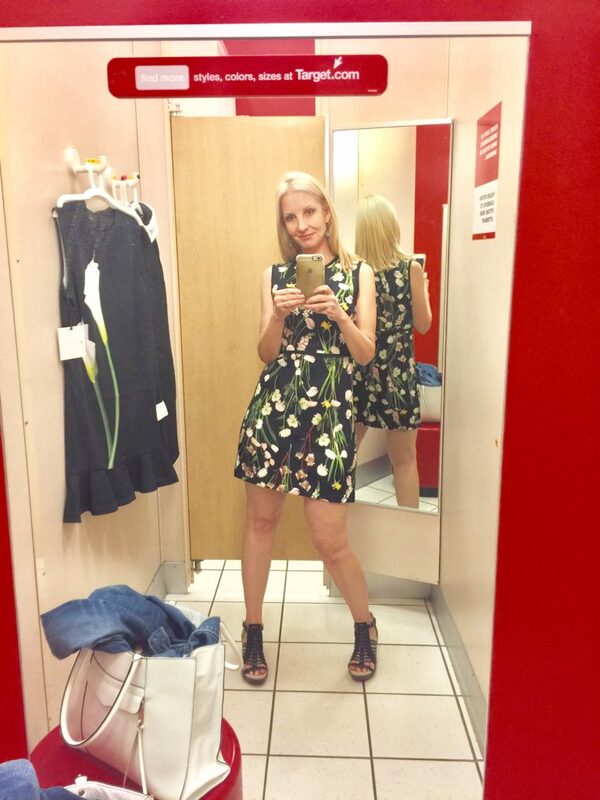 This floral dress was made of really nice scuba fabric and a very cute cut, but again WAY too short for me. Small fit, except for the length. A drop waist dress in black and tomato red. Super cute, but who looks good in drop waists? No really … I want to know … who?! Drop waist with lily print. True to size. I decided to try a medium dress. The length was a little bit better, but still too short and definitely too big! I really liked this appliqué though and the fabric was nice. 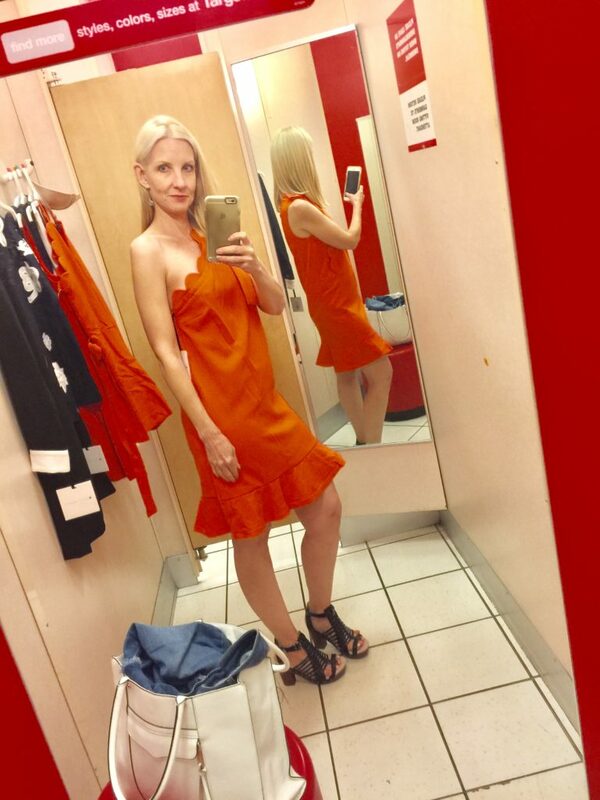 This orange dress had really nice fabric, though the zipper kept sticking. And it kind of reminded me of the Flintstone’s! The small was too big on top. The shirts all seemed to run really large. This button down shirt with the bee print was huge and this is an XS! This navy sweatshirt was super cute and good quality. Be sure to size down. 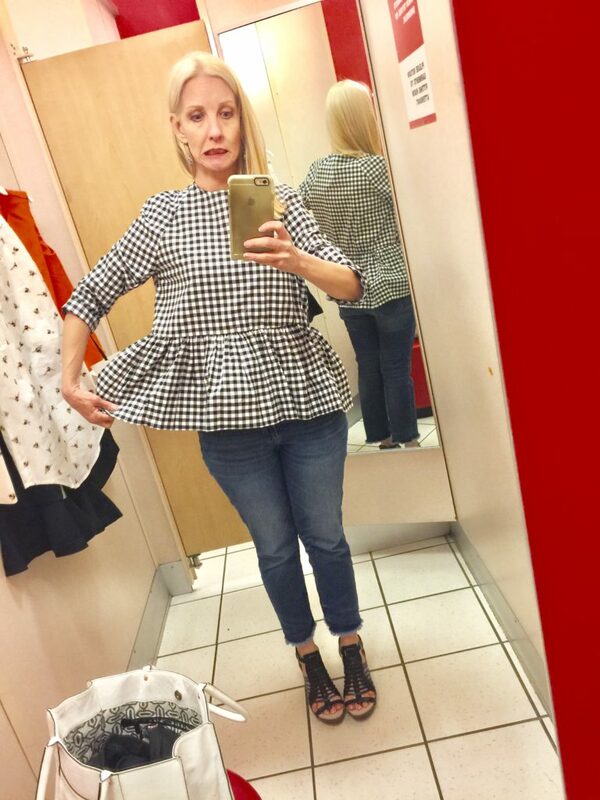 This XS fits like a M.
Cute gingham top! If they had an XS I would’ve tried it, but the small was way too big. I wish they had had the full collection at my Target so I could’ve tried on everything! Oh and by the way. I don’t have any kids to shop for, but I glanced at the baby and girls outfits and they were super adorable. Did you buy anything, Dolls? Let me know! I thought the collection was a bit to whimsical for me .. but glad I got to see these items ‘in action’ on your blog. I do like your first pick ~ the orange top with scallop white edges is super cute. True! Straight dresses and peplum tops aren’t often pear shape friendly. I also really liked the navy top with the applique flowers ~ quite cute ! Love he sweatshirt and the bee top. Will def seek those out! You look fab, as usual! The sweatshirt and bee shirt were both really cute and nice quality for the price, Rina! The top you bought is super cute, Dawn!! Considering I’m lucky if I measure 5’2″, then I’m thinking this stuff is right up my alley!! I may have to go check it out! It would probably be fabulous on you, Patti! Be happy that there is a target at all near you! These dresses would be awesome if they would just invest in 3-4 inch more fabric. We don’t run after 4 kids. Thus our legs aren’t able to bear the short length. Haha …. that’s true! 4 inches of more fabric would’ve totally made a huge difference to me! It’s odd that the dresses are all so short, don’t you think? Considering that VB always seems to be so chic…and in longer skirts more often than not. And bunnies on the collar??? Really? Haha .. I know, right? WTH?!! I had my eye on this collection and was able to pick up a few things at my local Target. The quality is really good, with lots of nice detailing. 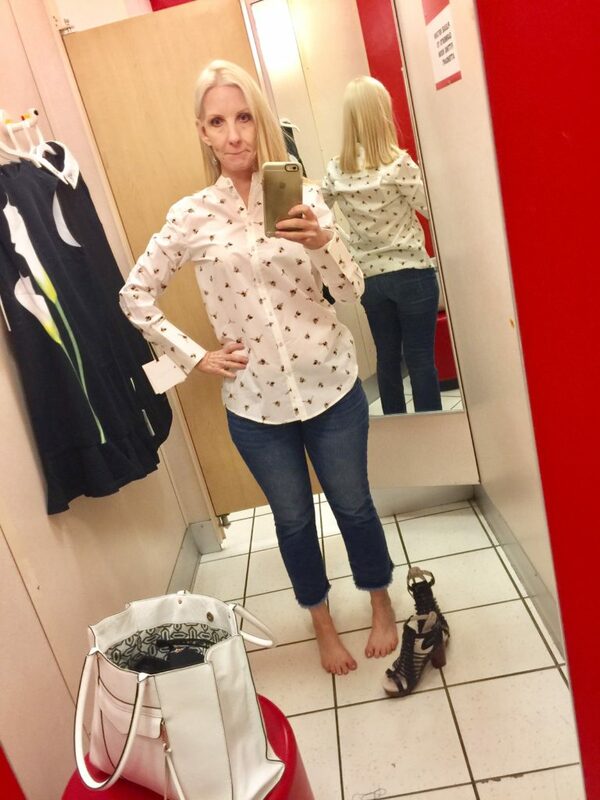 All of the items I bought fit my frame, although some may have been a little short but that was probably the look that VB was going for.Also I really wanted the long pants, but the fit on them was poor – loose around the waist and tight on the thighs. Overall I think this is a great collection. Thanks for the fit advice about the pants! I wanted to try those, but they didn’t have them in our Target. Let me know what you get! Yes, waaaaay too whimsical… cute “Mommy and me” line… super bummed. I wish she would have done a line that resembled what she actually wears! Yes, it ended up being big on Mommy & me Easter outfits! I’m sure the dresses would look adorable on you, Mica!! Dawn I am so with you on the too short. I’m 6feet tall some of those items were too short to even be tops. I tried on what I thought we a pretty orange top and it ended up being a romper! LOL. I didn’t even put THAT photo in my blog! Haha! I tried on so much and there were plenty of hits and misses. First, I can’t picture Victoria Beckham wearing any of this, so that gave me pause.The patterns and appliques are no “signature” that they’ll get old fast. And, everyone will be wearing them. 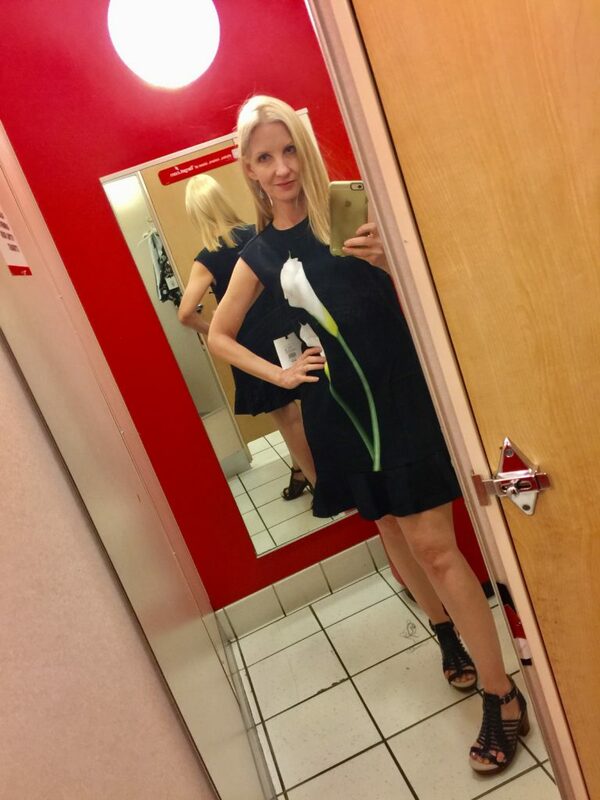 When you see more than one person wearing head-to-toe calla lilies, you know it’s toast! I found fit issues were a problem throughout the collection. The long black pants were a huge disappointment as they were cut without any room for actual hips-very specific body type only. The matching top was really nice. 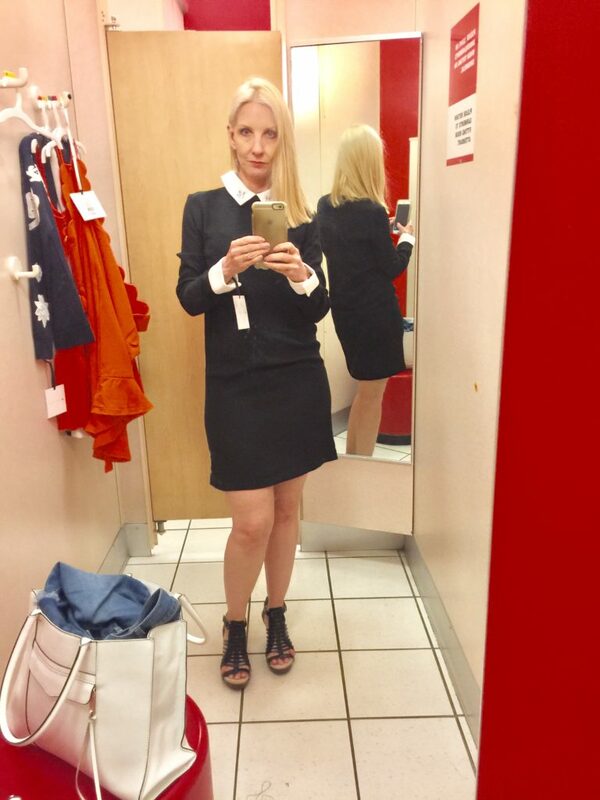 I too found the dresses to be impossibly short and in particular, the few skirts were insanely short. The lace dress fit well and was long enough, but a mint-green lace dress? I know it’s a near-prefect replica of her expensive one, but the color? Same for the pink damask pieces which seemed very Amal Clooney but felt like cheap tablecloth material. What I did like (and bought)) were the white long sleeve shirt (very elegant), the scarves (nice fabric-could have done without the writing on them), the navy blue applique sweatshirt, and the gingham dress. The sleeeve on that dress are a bit strange, but it’s cute and summery. 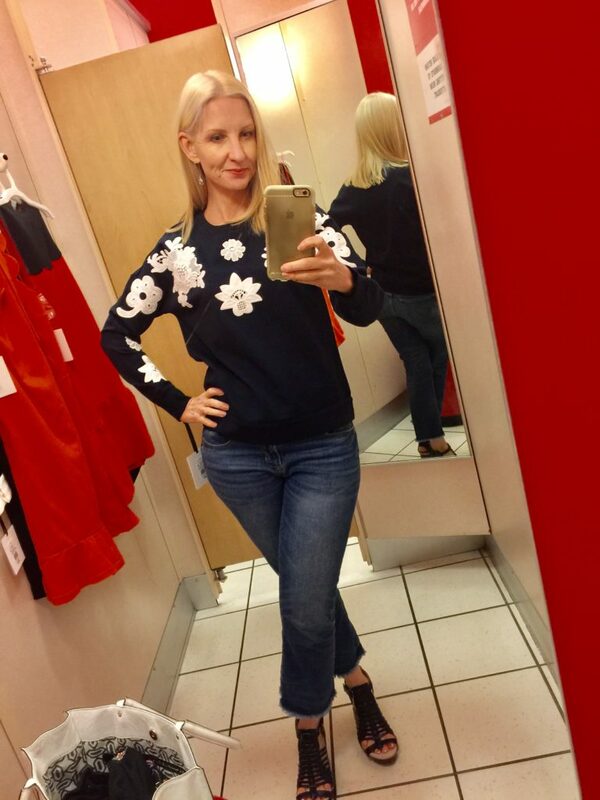 I’ve ordered two online only pieces (a sweater and a jacket)–we’ll see! Thanks for your excellent review! Ugh so frustrating! The red looks great in photos. Helps so much to b able to try on in person before buying. Thx for the work! Been on vacation this week, I was unable to get in and try any of the pieces on so thank you for modeling them for us. I do love a drop waist dress, but what is up with the length of all the dresses? That’s a nonstarter for me as well. I do love the orange top you got I think it’s perfect on you. And the Flintstone dress looks like it had potential. I heard from a few readers that they love the kids stuff so maybe that’s where it was really at with this launch. Thanks for all your photos love him! OMG! How is it possible! I am publishing this Friday a post about VB and mentioned that Target sells her collection now. Note: I live in the Netherlands were they never heard of Target. I am sorry. I don t want to hear anything bad about VB!???? Haha … well it wasn’t all bad! I love my little orange top! And if you’re petite, the dresses are probably the perfect length! Everything is so cute on you! Hey Ladies, if you’re petite, check out this review!! I think the white long sleeved blouse is exceptional. I also love the scarves. Such a thorough and wonderful recap of Victoria’s line. Everything of hers I bought I actually ordered online. I have all dresses 3 thru 6 that you tried on. I wish my own Target had the scalloped orange+white top you got though. But I may still order it. You might be quite tall because on my 5.6′ figure all the dresses’ lengths were fine. The asymmetric dress I found it big on top too, though I wear a C cup but it was still too cute for me to pass on. I wish I had seen the gingham top though but I’d probably needed an XS too. I also bought 4 dresses and a set for my daughter as well, a couple of those to match with mine. Overall, it was one of my most favorite collaborations and the dresses were very nicely made for the price of 35-40 bucks each. BTW I linked the Calla Lilly Dress and a VBxTarget Dress my daughter wore on your latest linkup, today. Come take a peek. 😉 Thanks.